This system has been designed to teach real people how to earn real money from the internet in plain terms so you can put it into ACTION immediately. This system is used every single day. Ever heard the saying, "If It Ain't Broke, Don't Fix It"? I have a better saying for you. . .
"If You're Broke, This System Will Fix It!" And, no matter what you're selling, or how you're selling it, this system can be conformed to fit. Just following the 4 simple steps outlined in this guide is all it takes. But you must follow each of the steps to see any type of positive results. Reality Check: Absolutely NO system will earn you profits overnight. NO system can guarantee you will earn millions. NO system will do all the work for you. You must be willing to work at this for the system to work for YOU. 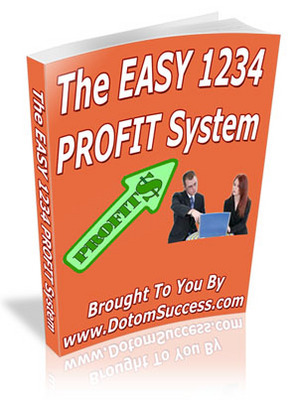 This EASY 4 Step PROFIT System WILL work. It won't make you a millionaire of course. If you're looking for that type of product, then this isn't the system for you. There are plenty of those types of "scam" products floating about that you can waste your money on. This system is designed to teach you how real people earn real money from the internet in plain terms so you can put the system into ACTION immediately. This 4 step system was developed for people that are new to the world of earning money online, although it is a fantastic system for those seasoned as well. Now, are you ready to take control of your online profiting potential? In fact, you may be thinking it's too simple, but don't worry, each step is thoroughly explained so that you can use this system quickly, and easily, to generate as many "ports of profit" as you wish.